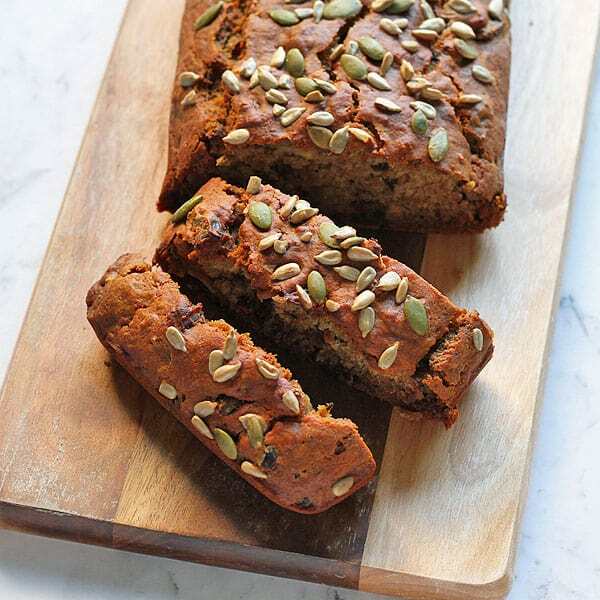 This Healthy Date Loaf is full of flavour and made for sharing. It’s vegan, refined sugar free and on the table in 40 minutes. 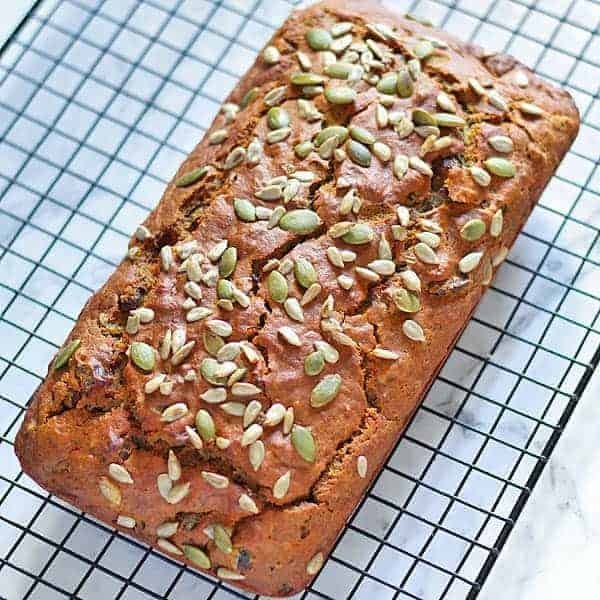 This healthy date loaf was first published exactly a year ago, and since then has become one of the most popular recipes on the blog! Every day a steady stream of googlers find their way to this recipe, so I thought it was about time I gave it a facelift. New photos. Recipe tips. And a pre-amble that was more fitting to this delicious loaf. Dates are natures candy, and I won’t fool you into thinking this loaf is “sugar free”. But it’s filled with good for you ingredients and is the perfect treat for morning or afternoon tea. I love that I nearly always have the ingredients for this on hand, so I can whip it up when in a pinch to feed unexpected guests. This date loaf lends itself well the modifications, so if you don’t have an ingredient in the cupboard, don’t stress. There is probably an easy substitute that you already have. 1. What can I substitute for rice malt syrup? Any liquid sweetener you prefer or have on hand. Honey or maple syrup would work well. 2. What should I top my loaf with? I’ve made this loaf in 3 different ways – no topping, topped with sliced banana, and topped with sunflower and pepita seeds. I love them all equally, I just happened to have seeds on hand the day I photographed it. Banana will caramelise and add even more sweetness to your loaf – so let that be your guide if you are a sweet tooth like me! 3. Can I substitute wholemeal flour for anything? 4. Not a fan of coconut oil – what else can I use? Olive oil, rice bran or whatever you use at home as long as it has a mild flavour should work. 5. Can I add walnuts into the mixture? Absolutely. Just mix them in right before you pour your mixture into the date loaf. No other changes to the recipe required. 6. I hate dates – what else you got? May I introduce you to the world’s best healthy banana bread recipe. You’re welcome. 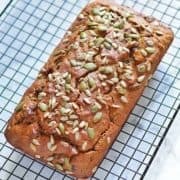 If you’ve tried this Healthy Date Loaf I’d love to hear how you enjoyed it! Pop a comment and a star rating below! You can also FOLLOW ME on FACEBOOK, INSTAGRAM and PINTEREST. 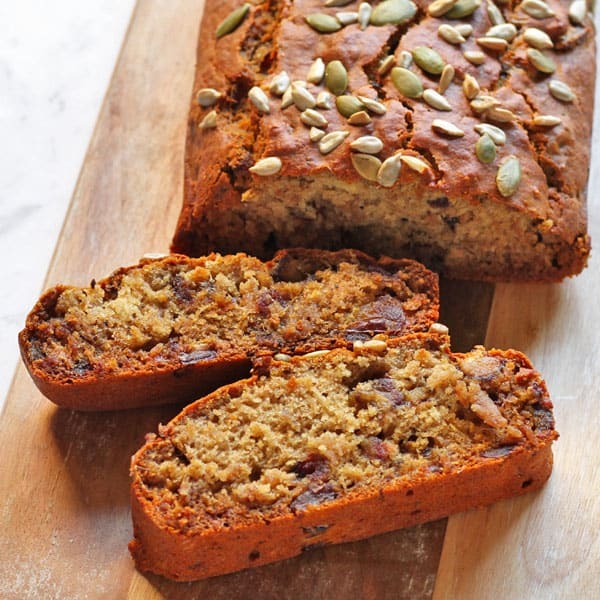 This Healthy Date Loaf is full of flavour and made for sharing. It's vegan, refined sugar free and on the table in 40 minutes. Place oil, syrup and dates in a mixing bowl. Pour over boiling water and mix until all combined. Add in sifted flower, baking powder, bicarb soda, vanilla extract and spices and mix until combined. If you are adding banana on top, press down on top of mixture with the cut side up. Pour into baking tin and place in oven for 30 minutes, until cooked through and a skewer comes out clean. Leave in tin for 5 minutes then move the loaf to cool on a rack. You can sub rice malt syrup for honey, maple syrup etc. I'd start checking on the loaf around the 25 minute mark. Cooking times can vary dramatically between ovens so best to be on the safe side! Nutrition is a rough estimate and is for one slice if you slice loaf by 10. YAY! I’m so happy to hear that Amanda 🙂 It’s definitely one of my favourites and so easy too. Thanks lovely 🙂 I think dates are definitely an either love or hate thing! My son loves bananas and bread! I’m sure he’d love to try this one out, I’ll have to see how he likes it! Thanks for sharing! I wasn’t sold on the sliced banana on top until you said “carmelized!” Thanks for the unique tip! I think it adds to the flavour but you can always leave it out! Hoping for a quick recovery!! This bread looks amazing. Im making for my family! This looks totally delicious. I will have to make this for my niece and nephews soon, they will love this. I’m sure they will Luci! awesome! Hope she loves it! This looks like a great bread! My daughters would probably like it simply because it looks so different than our traditional banana bread. I love using dates in recipes!! They are still so sweet but so much better for you! Thank you for sharing! This does look awesome. I would have never thought to add the bananas like that right atop the loaf. But now that I am thinking about it, I am going to have to try this out in the near future with some other loafs I do. It adds delicious flavour with the caramelisation of the banana! Nice recipe and sounds yummy too! This recipe might just get my family to love dates! I love dates and this is why this post caught my attention! This is perfection! They are so sweet which makes them perfect for baking! This is a really good recipe. I also love how you presented it in a unique way with the sliced bananas on top. Thank you! He is on the mend thankfully! I love using dates and bananas in my baking. They are so sweet and full of flavor and allow you to enjoy sweet treats without processed sugar. It was so good – what kind of flour do you use in your baking? Dates are kind of miraculous!! Thanks for the recipe, I’m going to give it a try. i love cooking with banana and this looks like the perfect way to incorporate it into a bread! That sounds like a delciously sweet and wholesome recipe! I bet it tastes caramelly with the dates too. I’ve never thought of lying the slices of banana on top for decoration. I am also not that good at cutting things so that might be part of it! Haha I actually didn’t cut this banana in a perfect half for this either – but luckily once you press it into the mixture no one can tell! I am always looking for healthier recipes to try. I will have to get the ingredients I need to make this recipe on the weekend. I have never even heard of a date loaf. This looks like it would taste so good! I’m happy to introduce you to it! Dates are the perfect natural sweetener! I hate unexpected events that involve surgery or the hospital! I hope you guys are okay, especially the husband. Girl, this loaf is so beautiful, it’s tough not to give it a try! This looks delicious! I love the way you sliced the banana and put it on top. That looks delish! I have to try this recipe! Ya know, I’m not sure if I’ve ever eaten dates! How weird is that? I’ve eaten, probably every other kind of nut there is out there. That’s one interesting recipe! The kids aren’t much fans of dates but I am! I would love to try this recipe one of these days. This looks really delicious. I am going to have to give this a try, I love the addition of the Banana. Thanks so much – let me know how you go! I hope your husband is doing better! What a week. I think this recipe is a must try especially if you love dates. It looks really good! Thanks Karen – he is doing well now thankfully! I have not had dates in forever! Might be picking some up this weekend to make this. Looks delicious. Hope you enjoy if you do! Oh my goodness I am bookmarking this! I love banana loaf, but have yet to make a vegan one. This must taste amazing with the added sweetness of dates. So sweet without much need for a sweetener! Thank you for this healthier recipe! We do not need loads of sugar when the recipe is this good! I am drooling on my keyboard here lol. Haha it is so good! I have had to exert lots of self control to not eat the whole loaf at once! My children will love this. Looks great! I love dates and banana bread! This looks so delicious! I like dates and this loaf looks yummy! Oh, I love dates so much, and never buy them, unless I have a reason. I think I found a reason! This looks so good. I’ve never had a date before. Does that make me weird? I am sure I’d like them, so I need to make this loaf so I can finally say I’ve tried a date. Haha I don’t think it makes you weird but they seriously are perfect for sweetening recipes!